Are you ready to sport a giant perma-grin for the rest of the day? 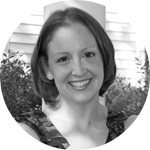 It will be hard not to after meeting my newest contributing writer, Megan from The Homes I Have Made. 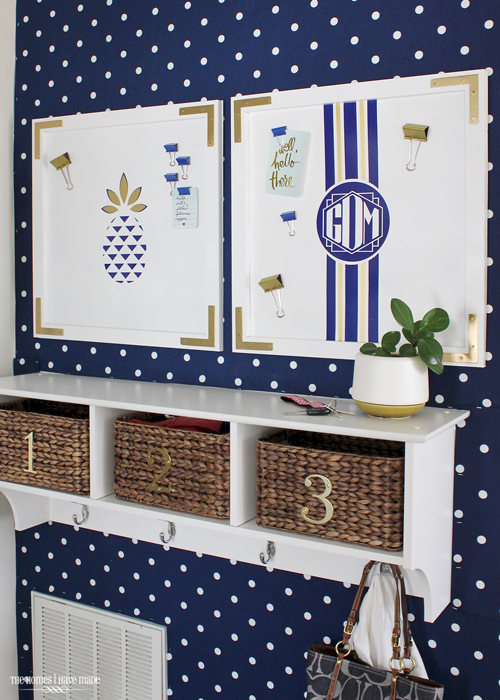 She is one talented gal, and she shares an endless variety of budget friendly projects on her blog. She is a military wife and mom and has moved over five times in the last nine years! She has learned a lot along the way, and I am honored that she will be stopping by throughout the year to share some of her favorite projects with us! Take it away Megan! One of the things I love most about organizing is that it’s an on-going process of continual refinement. I love to re-visit, re-work and tweak areas in our home, adjusting and improving our organizational systems until they function just as we need them to. It’s not that our original projects fail, but a family’s needs evolve and tastes change… so re-visiting past projects is just part of creating a well-organized, personal, and functional home! Many of you long-time iHeart Organizing readers may remember our family command center that Jen featured years ago. I was super proud of that command center, and for a long while, it was exactly what our family needed to stay on top of life. In the last year or so, I started to realize that we were no longer using some of the organizational systems I had setup. The baskets were under-utilized, the wall pockets became over-run with papers never filed, and the post-it note system was too cumbersome to maintain. In addition to noticing what wasn’t working, I also noted what was: our single magnetic board was filled to the brim with papers and notes we didn’t want to lose track of or needed to follow up. Instead of piling papers on counters or filing them away into folders, I realized that we are a pin-it-up-for-all-to-see-and-find family. Ah ha! Instead of forcing systems that just weren’t working, I decided to embrace what was. Out went the visual clutter and the multiple organizational systems and in came two large magnetic sheets from the hardware store, providing ample room for putting up whatever we needed. 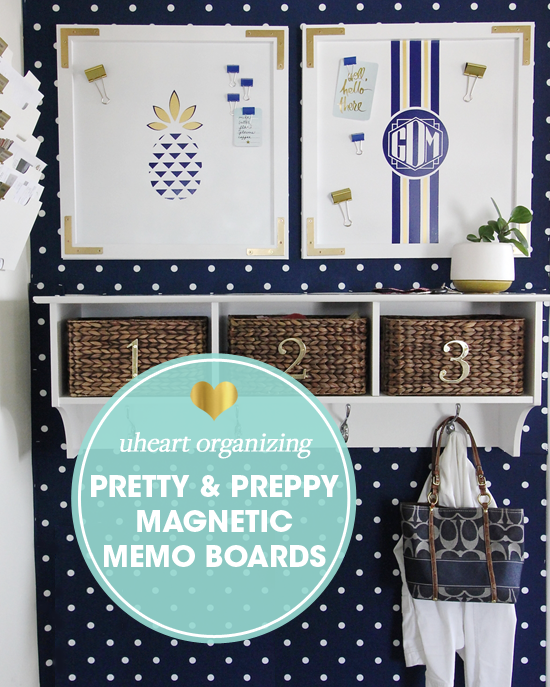 After weeks of staring at plain sheets of metal haphazardly screwed to the wall, I was instantly inspired when I came across these darling magnetic boards from PBTeen. Instead of forking over the cash, I knew we could make a version ourselves. 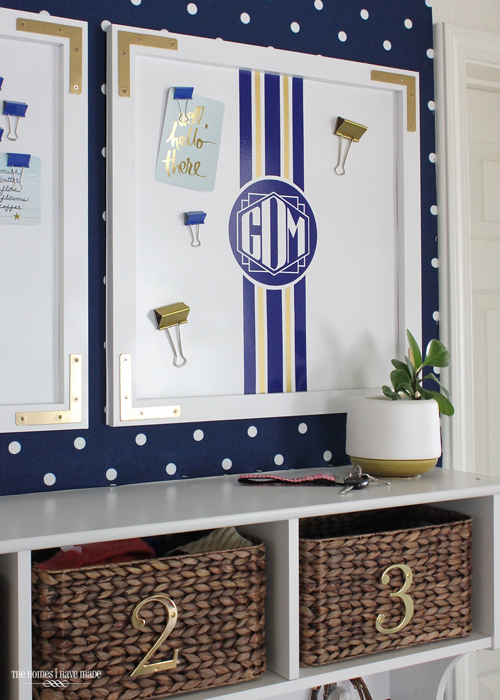 With the addition of some wood, paint and vinyl, we suddenly had oh-so-charming and super functional magnetic memo boards. 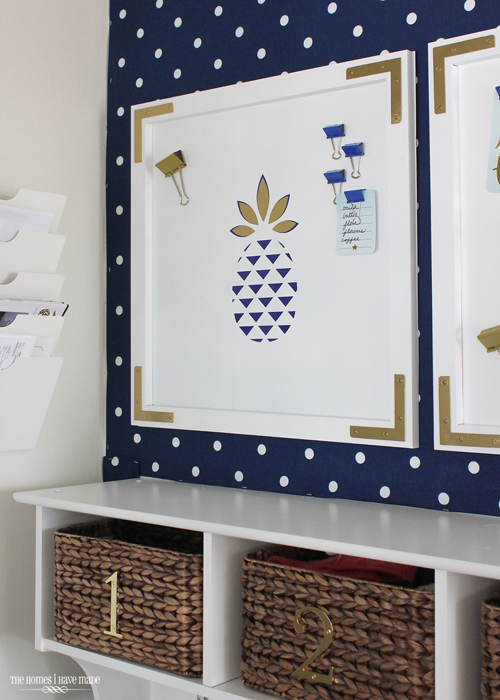 These magnetic memo boards were quite simple and so much fun to put together. I had such a blast fully customizing them to our family’s style and needs. They came in much cheaper than the PBTeen version, and their chic and preppy vibe make me giddy every time I walk in the door! 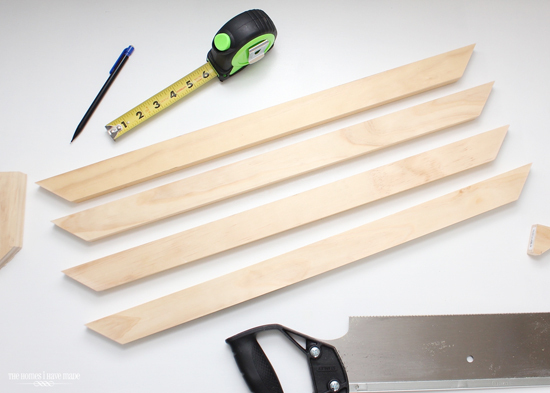 Start by cutting down the 1x2x8 pine into 24” lengths with 45-degree ends using a miter saw. Note in the picture below, the long edges measure 24”. 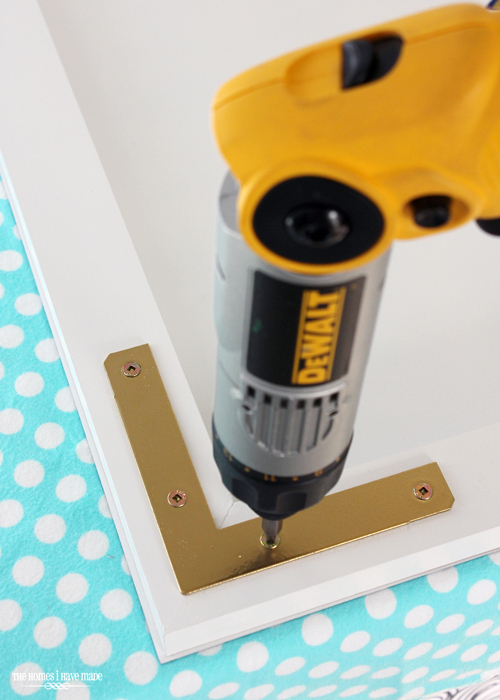 Don’t shy away from this project if you don’t own any power tools. We cut our wood down with a simple saw, miter box, and arm strength! Place the mitered edges of each 24” cut together to form a square. 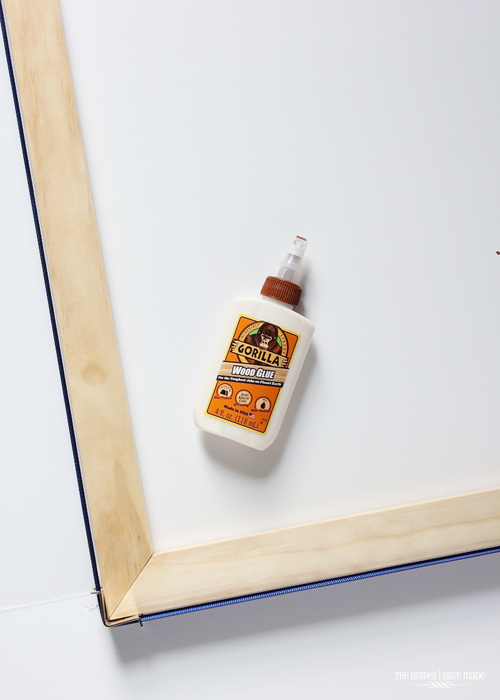 Add wood glue at each junction and cinch the entire frame down with a band clamp. Allow the wood glue to fully dry and cure before moving on. 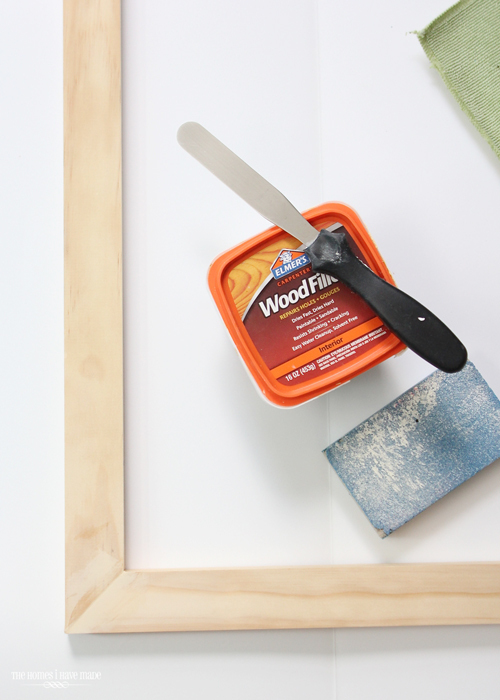 Once your frame is dry, fill the corner seams with wood filler and sand smooth. Be sure to wipe away any dust before painting. Take both your newly constructed 24” square wood frame and the 24” square sheet metal to a well-ventilated area (preferably outside). Prime both the frame and the sheet metal with spray primer. Once dry, sand smooth and wipe away any remaining dust. 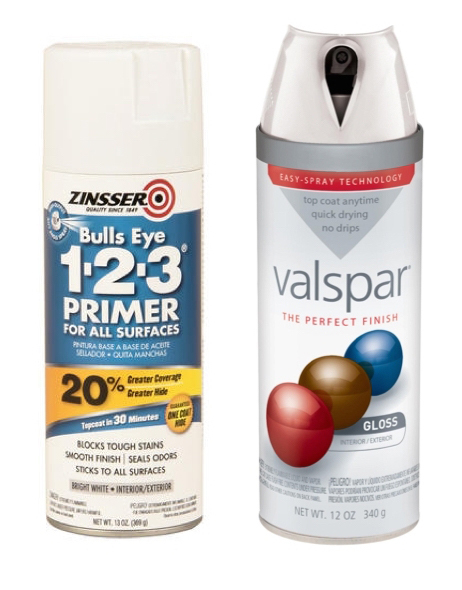 Next, give both items 2-3 light coats of white spray paint and allow to dry over night. 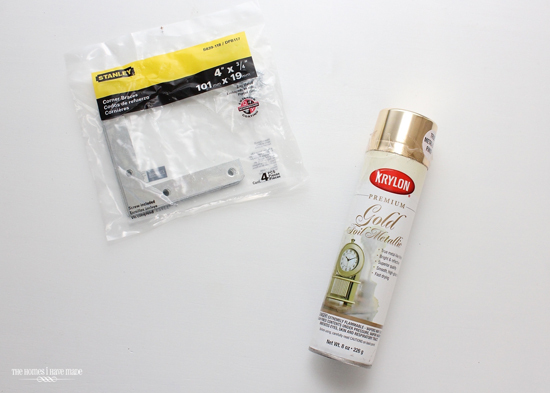 While you’re painting, also spray the metal corner brackets with gold metallic spray paint. This is my first project using this Krylon Metallic Spray Paint, and I love the metallic sheen it gives to most surfaces! 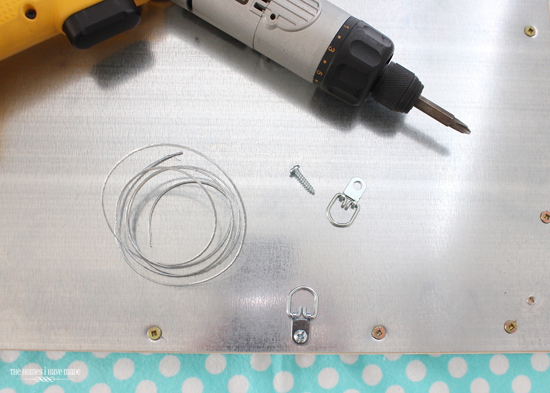 Once the frame, sheet metal, and corner brackets are fully cured, it’s time to assemble to magnetic board! Place the wood frame right-side down onto a clean, protected surface (I put mine down onto some soft, clean, flannel). 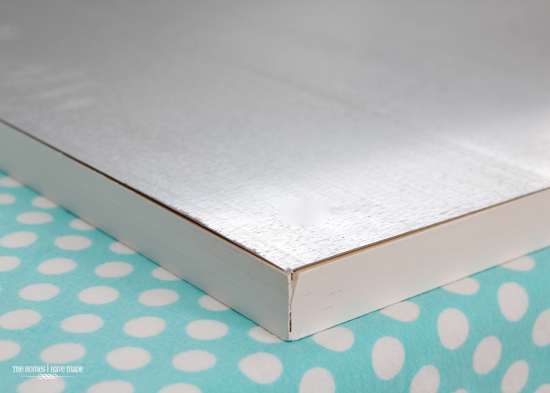 Place the painted sheet metal right-side down on top of the wooden frame. 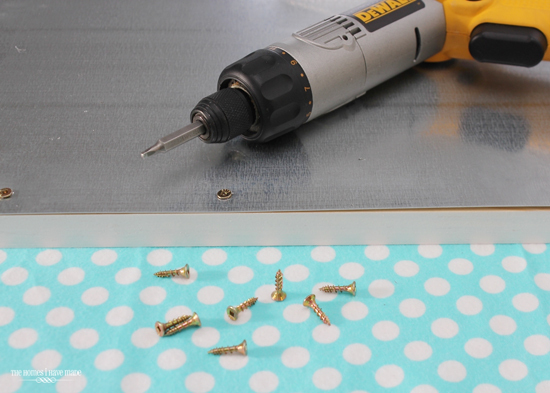 Using ½” wood screws, attach the sheet metal to the back of the painted wooden frame all the way around the perimeter. Be sure not to get too close to the edges of the wooden frame or the wood may split. Attach hanging hardware to the back of the memo board. I used D-rings and picture-hanging wire about 6” down from the top of the board. Flip the board over and attach the corner brackets with more wood screws. Not only are these decorative, but they add some more stability to the entire frame. 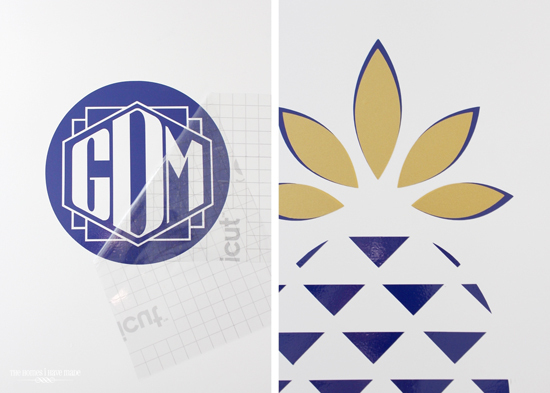 If using vinyl, it is quick and easy to transfer your images using clear transfer tape. Slowly and carefully, build your designs one element at a time. 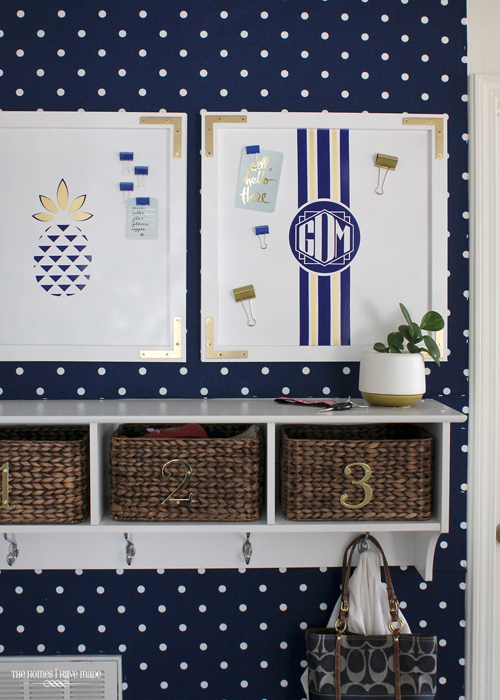 I added the monogram first, then the blue stripes, then the gold. The nice thing about vinyl is you can remove parts of the design that don’t look right or get too busy. I originally had more in mind for the pineapple board, but as the two boards came together side-by-side, I preferred the simpler aesthetic on the second board! With the vinyl images done, all that’s left is to hang the boards in a convenient place. 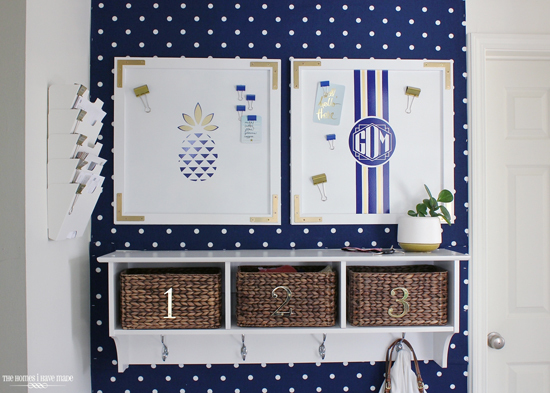 To really help my boards pop, I covered the wall in navy and white polka-dot fabric (held in place with a staple gun). I absolutely adore the play on patterns here - I’m pretty sure this is my favorite spot in the entire house! Like I said, we are a clip-everything-up family. Besides just magnets (that can slip and slide with too many papers under them! ), I really wanted some fun clips to add to our board. 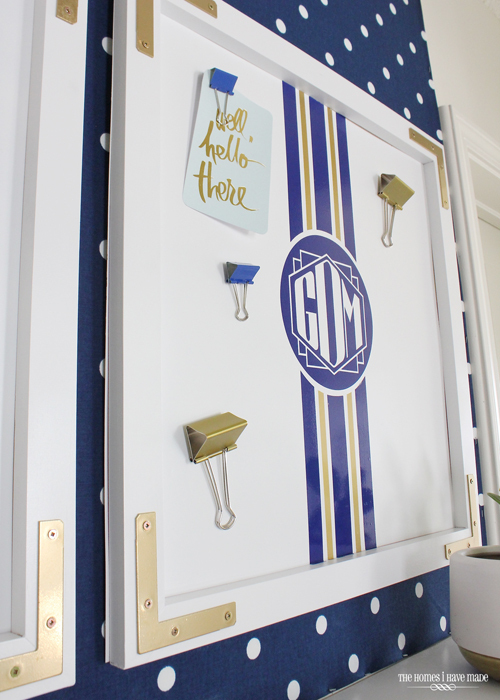 These binder clip magnets are one of my favorite element of this entire project – I can’t wait to show you how fun this is! 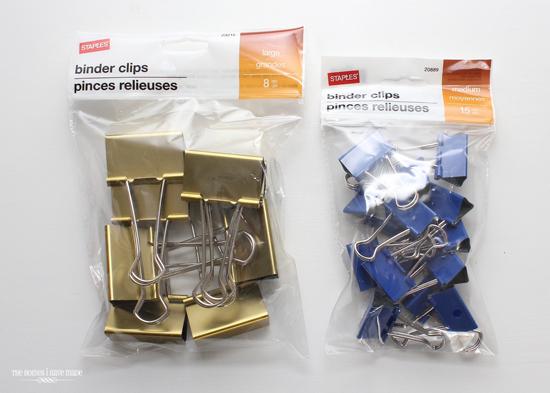 I came across these large and perfectly-colored binder clips at Staples (they were buy one, get one free). 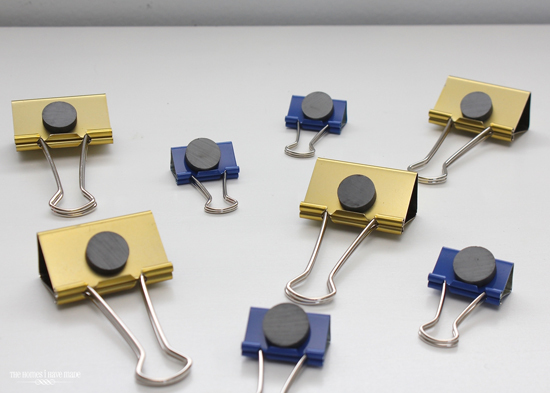 Lo and behold, the binder clips themselves are magnetic! No glue necessary. 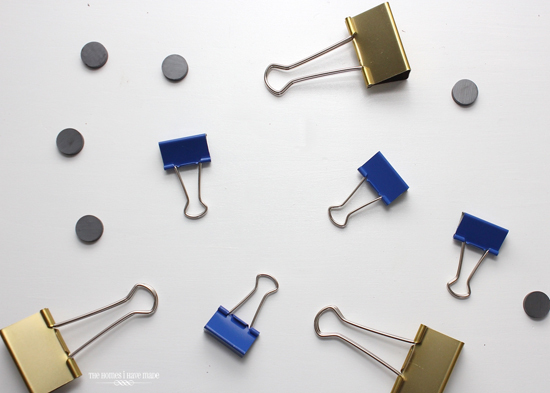 The clips stick to the magnets…the magnets stick to the sheet metal..making for the most adorable and uber-functional magnetic clips! What’s more fun? 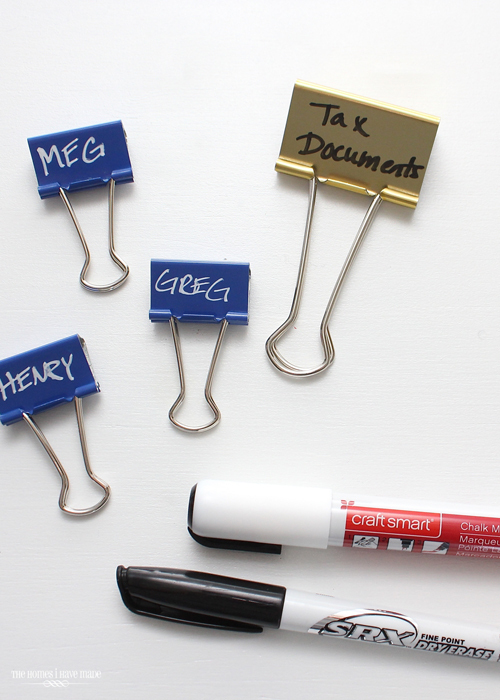 These metal clips can easily be written on with both dry-erase and chalkboard pens, so you can temporarily label things as you clip them up on the board! Done with a specific note or label? Just wipe it away! I did a major happy dance when I discovered how fun and easy these clips were to use on the magnetic surface. 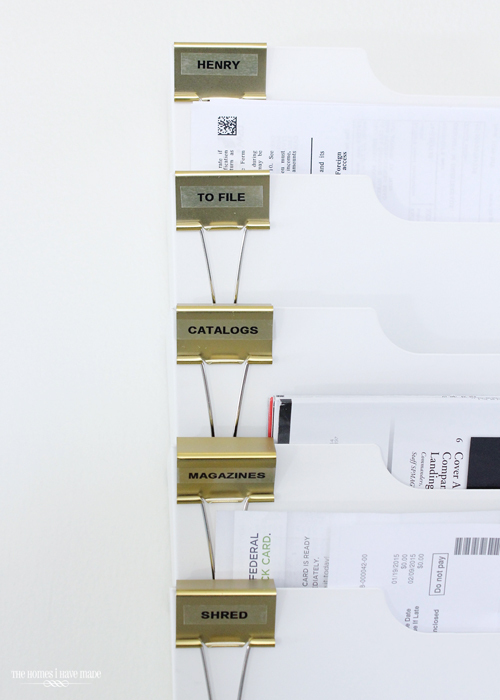 Now, we can use the bare magnets to hold up papers or add the clips to hold up heavier stacks. And gosh, they are just too darn cute! 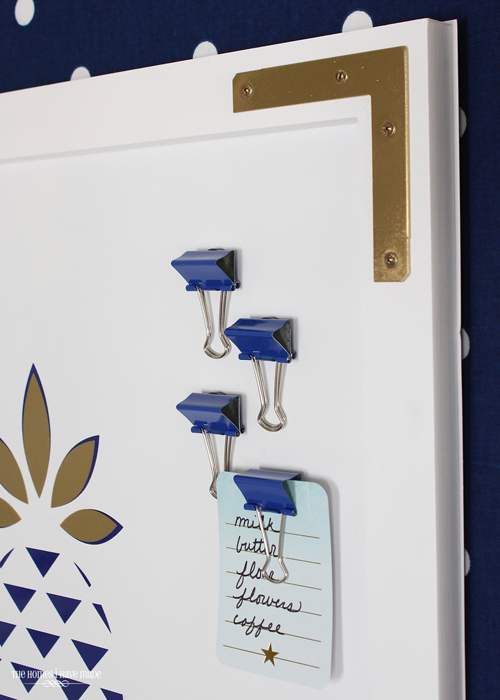 I loved the clips so much, I even gave my last few gold ones some more permanent labels for our wall-pockets (which have be re-designated into more useful categories). 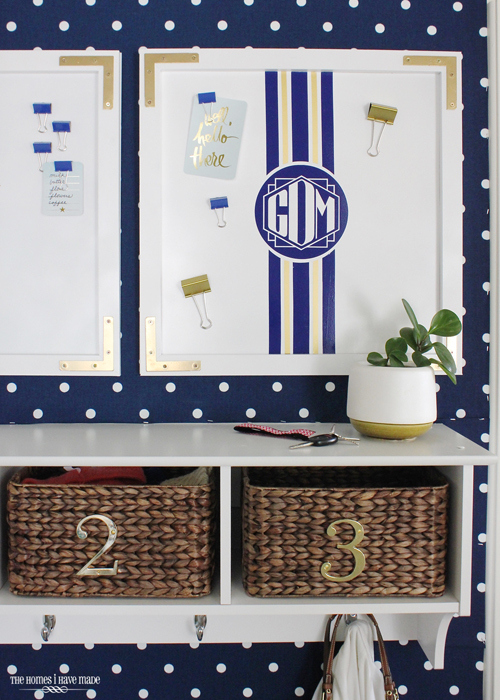 All in all, these memo boards are such a fun, fresh, and functional way to stay organized. I love looking at them with all their fun colors and patterns, and am ecstatic that we now have plenty of space to tack up all our important notes and papers. 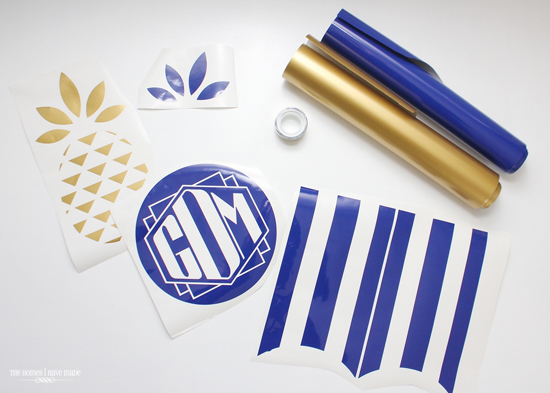 Between the sleek monogram and the oh-so-trendy graphic pineapple, I really can’t pick a favorite! These boards serve as a vivid reminder that sometimes it’s good to re-examine and re-adjust things around our home, no matter how much we love them or are committed to the original concept. If something just isn’t working, a few hours of brainstorming and DIYing can drastically change the way a space looks and functions! Not only are these boards much more functional for our life right now, but the more streamlined look of this entire nook has me one happy lady! A huge “thank you” to Jen for having me here today as a new member of her Contributor team. I have been a long time reader of iHeart Organizing and consider myself Jen’s number one fan… I really couldn’t be more thrilled and humbled to be here sharing some of my projects with you all! I hope you’ll stop by The Homes I Have Made to say “hi,” where I am most-often neck deep into decorating and organizing our military base housing. These days though, I’ve spent a tad too much time sitting in our hallway gazing at our newest memo board project. I'm so happy to see Megan here! I've been following her blog for a long time and it's one of those that I (just like this one) check every single day!!! I love how clean and fresh and ORGANIZED this all looks. Great job! I love the navy and gold combination. It's my favourite right now. Looks good! This is gorgeous! I love how the boards came out! These boards are the cutest thing ever!! I love them! What a fantastic project. Love the happy preppy vibe. Cannot wait to visit Megan's blog and see more. such a stylish solution - love it! This is seriously so adorable! My bedroom colors are coral and turqouise, so I'd love to try and create one with those colors. Thanks for sharing! I LOVE everything about this board! well well now i feel crafty, this looks so good!! !! That is so great that you were able to reexamine your system and come up with something that will really work for your family. And I love the design you put on the boards...great job! I'm obsessed with anything navy so this ON POINT for me! LOVE! These are amazing! Love the entire wall!!! Awesome project. I love the navy blue-gold combination. This is awesome, functional and o so pretty. I could see why you would gaze at this all day! I absolutely love the look of the boards but wonder how they look once they're filled with all of the important papers and notes. How do you keep it from looking cluttered? Thanks! So glad Megan is a contributor! These 2 blogs are the ones I check daily. Great style! 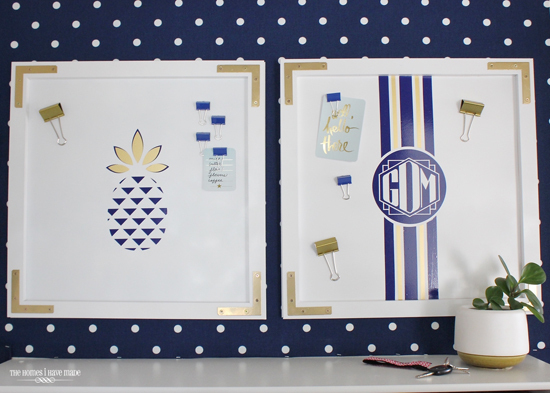 um i am just a obsessed over these magnet boards! i am 100% preppy and this speaks to my heart! OMG am in love with your dotty wallpaper!! A huge thank you Megan to your husband and to your family for your service to this country! Great tutorial, I am thinking about trying this in our office! I love the kitchen remodel and the paint color! I love paints that give me a different look everyday. Nothing is the same o same o. I also want to say you are a blogger and a blogger should say it like it is. Many times we start something that we know we can accomplish and get it done right .. then there are other times we know..we have that gut feeling that we might get it done but not as well as a professional could do it. Your decision to have a painter do your ceiling is EXACTLY what I wanted to hear. You are Not going to get up and paint that ceiling for years! and this is your home..a place you live not just some model home ... it should be done to last and be the best you can get! Hats off to you and your hubby for doing all the things you do and for sharing with us. I realize this is an older post, but any chance of getting the name of the online monogram maker and or font used for the monogram in the command center? Love it! Thanks!